The La Spezia Bay is known as the Gulf of Poets, because many poets have praised its beauty throughout time, also chosing its shores as their home. 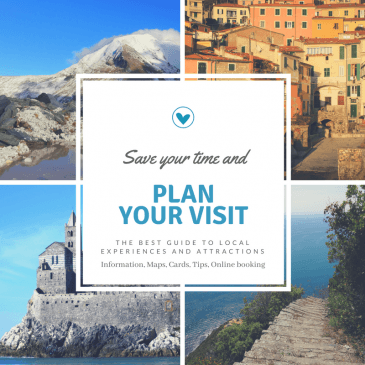 The best advice to visit the Cinque Terre area is to pick one of the five villages to get off the train or boat and travel to one of more others, according to time available. In high season, the visit can be spoiled by the presence of too many visitors, while most important thing in the Cinque Terre is to get the opportunity to enjoy the relaxed atmosphere, hike the nice paths in the silence of nature, enjoy the enchanting sea view, rather than running from one village to the other. The easiest way to get to each of the Cinque Terre villages is by train or a boat from La Spezia to Cinque Terre. If you are traveling by car, best option is to park it in town and walk or take a bus to the station, as in the Cinque Terre there are very few car parking lots. Even if you are based in a accommodation in the Cinque Terre, the train is the best way to get to the area. At La Spezia railway station and in all villages you can pick one or two of the villages and buy a single ticket to get there (about 7,50€ return ticket to reach the most far village). If you prefer to visit the whole area you can get a Cinque Terre Park ticket. Make sure to buy the “Cinque terre Train Card” and not just the basic Cinque Terre Card, which only allows walking on the paths of the Cinque Terre Park and not to hop on and off the train. The Cinque Terre is a very popular italian destination located in the Riviera, west of the city of La Spezia. A common mistake is to consider the Cinque Terre as a single place, rather than an area. There is no such thing as a train ticket to the “Cinque Terre”, as the name actually means “Five territories”, namely the five hamlets of Riomaggiore, Manarola, Corniglia, Vernazza and Monterosso, which look almost suspended along the rocky coast between La Spezia and Framura. The fascinating surrounding nature is a seamless dialogue between sea and land, a unique feature of the Cinque Terre landscape along the coast enclosed by the two promontories of Punta Mesco and Muzzerone. Spurs of stone, coves and bays, ravines and the five colorful villages counterpoint the view of the Cinque Terre coastline from the sea. It should be noted that the five villages are really beautiful, but not too different from each other, and that hiking in the Cinque Terre to admire the unique spectacular sea and cliff view is definitely the thing to do here. So rather than running from one place to another, we suggest to visit one village, walk the path to the next one, swim a bit, relax with a nice drink, gelato, aperitivo or dinner there, enjoy the breathtaking sunset view from any point of the cinque terre, in summer enjoy the lively nightlife, then take the last train back home. By car, the roads to reach Cinque Terre are mostly narrow. There are not many parks and can be a good idea to reah villages in other ways. By train, each villages of Cinque Terre has a train station. Check the Cinque Terre Card, with benefits also for those who love trekking. By ferry, you can reach Cinque Terre during the summer. To get to Cinque Terre, please visit our ferry schedule. Numerous marinas for private pleasure boating. In Manarola, Vernazza and Riomaggiore from 10 a.m. to 6 p.m. there is a lot of turnout, be patient and enjoy the views. The town of Riomaggiore is the first one of the Cinque Terre you reach from La Spezia, at about ten miles north-west from the city. It can be easily reached by boat, train or car, with a boat or the ferry leaving from La Spezia sea harbor. The village is crossed by the railway that goes to Genova and the train is the easiest, shortest way to get to Riomaggiore. The medioeval center is located in the valley of the river Rio Maggiore, the old Rivus Major to which the town owes its name and consists of several parallel orders of Genoese tower-houses that follow the steep course of the river stream. Riomaggiore is also connected to the village of Manarola by a path called La Via dell’Amore (the Love Path), a very romantic walk on the steep coast, from which you can see some of the most stunning views of the sea in the area. Unfortunately the Love Path has been badly affected by the 2011 flood and is still not accessible. If you like hiking, from Riomaggiore you can climb up to Montenero Sancturaly, across the most typical terraced vineyards, where the Sciachetra raisin wine is produced. Montenero offers a beautiful view on the sea and the other villages. It was only after year 1000 that, thanks to the safer seas due to the expansion of the Republic of Genoa, the inhabitants of the primitive hill settlements could gradually go down to the sea, thus giving rise to the first nucleus of the Riomaggiore village. Manarola was founded in the thirteenth century probably by the people who lived in the town of Volastra, the hamlet you can still visit on the back hills. In Manarola the railway plays a big role in the life of the town, it almost seems projected over the sea, whilethe station is a roof terrace. The railway is an important feature of all the Cinque Terre villages, which used to be isolated until the second half of the 19th century, when the bold engineering railway work was built. From the railway station, reach the marina in a few steps, here a short pedestrian tunnel leads to the starting point of the “Love Path", a breathtaking road overlooking the sea, built by the locals in Manarola and Riomaggiore to join the two villages, so close and yet so far, separated by a rough coast. 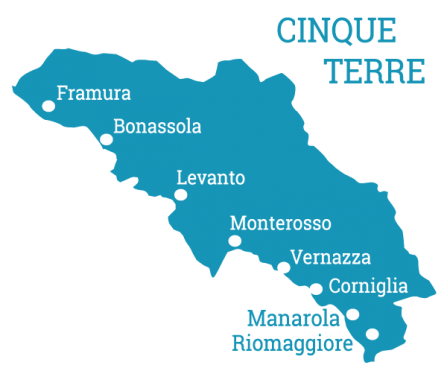 Unfortunately, the path has been closed after the flood that affected Manarola and other Cinque Terre Villages. It will hopefully be soon re-opened. The main (and almost only) narrow street that crosses the village and goes down to the sea, has restaurants, bars, and shops. The small harbor is like a Mediterranean natural pool. Looking west, you will be fascinated by the presence of a small cemetery overlooking the sea: strongly wanted and built by locals, the cemetery is one of the most peaceful and beautiful places in the whole area, communicating joy rather than sadness. If you hike to the upper town, on the way to Volastra, you can visit the small church of San Lorenzo, built in typical Ligurian style. Corniglia is located in a central position in the Cinque Terre, east of Vernazza, to which it is connected with a fascinating walk halfway between hills and sea, and west of Manarola. Corniglia is slightly different from the other villages of the Cinque Terre as it is the only village that is not directly on the sea, but sits on the top of a hill about ninety meters high, surrounded by beautiful terraced vineyards. The quickest way to reach Corniglia is on railway, then from its train station, climb a long staircase called Lardarina, consisting of 33 flights and 382 steps, or walk the winding Via Stazione. The whole village is spread along the main street, Via Fieschi, leading from the church of San Pietro to the panoramic terrace of Santa Maria. From here, you can get down again to the Marina, on the opposite side of the hill, with a rocky cove and a small harbor where you can easily get a canoe or a boat for a Cinque Terre tour. The origins of the village date back to Roman time; the name probably derives from Gens Cornelia, a family that owned this land. Interestingly enough when the Roman city of Pompeii was excavated, amphorae with the name “Cornelia” were found, witnessing the busy commercial sea traffic from Liguria to the rest of the Peninsula. During the Middle Ages, like for the villages nearby, the control of Corniglia was alternated among the counts of Lavagna, Luni and finally Genova. In Corniglia, you can find some of the nicest secret beaches of the Cinque Terre : one of them, Guvano, is famous as it is normally attended by naturists, and can be reached with a nice walk of about an hour. Vernazza is possibly the most ancient village in the area of the Cinque Terre, it includes some of its most ancient houses and churches. The richest genoese families used to have properties in Vernazza, whcich became an importan trading center in the Middle Ages. The first documented witnesses about Vernazza, which was the first castrum of the Cinque Terre, date back to a 1080 act mentioning the Castrum Vernatio as sea base of the Obertenghi family. Lords of Vernazza in the eleventh and twelth centuries, which probably used the natural harbor as a departing point for their ships and to defend the area against attacks by Saracen pirates. The Republic of Genoa later made Vernazza one of the main coastal bases for the commercial, political power of the eastern Riviera. An official allegiance to Genoa oath agreement was signed in 1209 among 88 leaders of the families in the Vernazza territory. The main street in Vernazza is a picturesque narrow street full of charm, which before opening to the marina square also leads to a beach which was basically created by the flood of 2011. The street has a vivid life and atmosphere populated with typical artisanal shops and restaurants. Monterosso al Mare overlloks a large bay with reefs and beaches, very appreciated by those who prefer comfortable bathing faciities rather than the rough coast of the Cinque Terre. It is locates east of Punta Mesco, at the end of the Cinque Terre Park. West of the village, touching the promontory of the Mesco, is the village and beach of Fegina, where the Monterosso local train station is located. The town was mentioned for the first time in a document dated back to 1056 in which the Marquis Guido Obertenghi, son of Adalbert II, made some donations on site Monte Russo. In the eleventh century, with the disintegration of the brand Obertenghi, the fiefdom possessions went to the Genovese counts Fieschi – and later in the twelfth century – the local lords of Lagneto, in contrast with the Malaspina family, Lords in the Lunigiana valley. In the thirteenth century the territory of Monterosso, as well as the entire area of the Cinque Terre, as the territory of clashes be tween the Republic of Genoa and the lordship of Pisa for the political control and the trade of this important stretch of eastern Liguria. Monterosso has many signs of its long and fascinating history, and offers a lot of chances to enjoy a beautiful cultural and sea day.